Perhaps more than any other animal, humans are fascinated with birds. We admire birds, we make a hobby of peering at them through binoculars; we lure them into our yards with seed; some of us even tattoo them onto our bodies. What’s the enchantment? It may be this: Birds have access to something we never will flight. 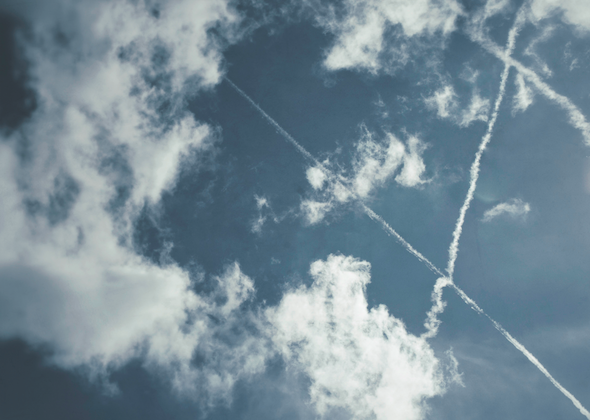 We humans can fake flight all we want, but we’ll never truly know what it feels like to simply spread our wings and soar. Here, 12 artists take inspiration from birds—both in their true form and in what they see from the heavens. For years, artist William R. Beebe has kept an almost daily routine. He observes birds in nature, and then he photographs them. Then, he paints them. 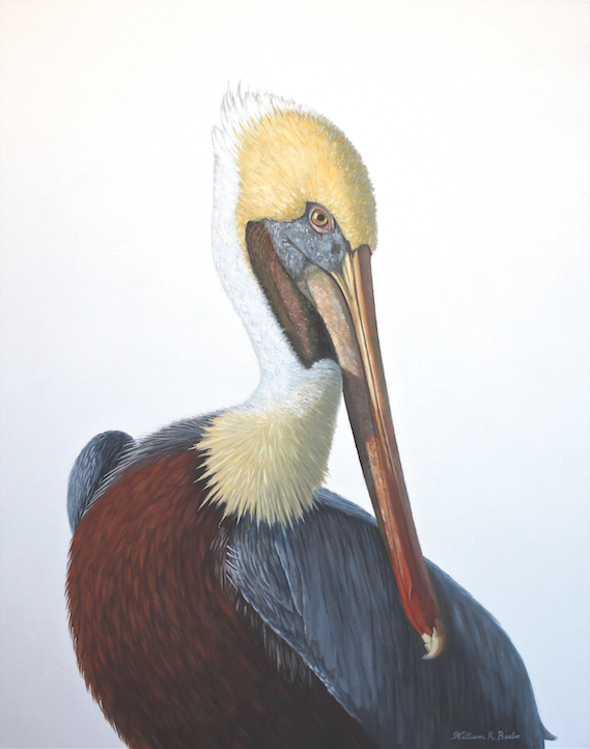 His recent move to Charleston provided ample access to marshland and its winged inhabitants. 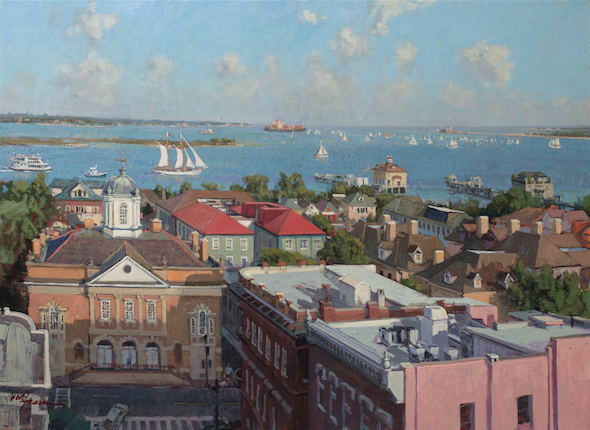 Beebe has been painting professionally for over 30 years, and in addition to his aviary art, these days he’s also working on a body of Charleston streetscapes and maritime scenes. 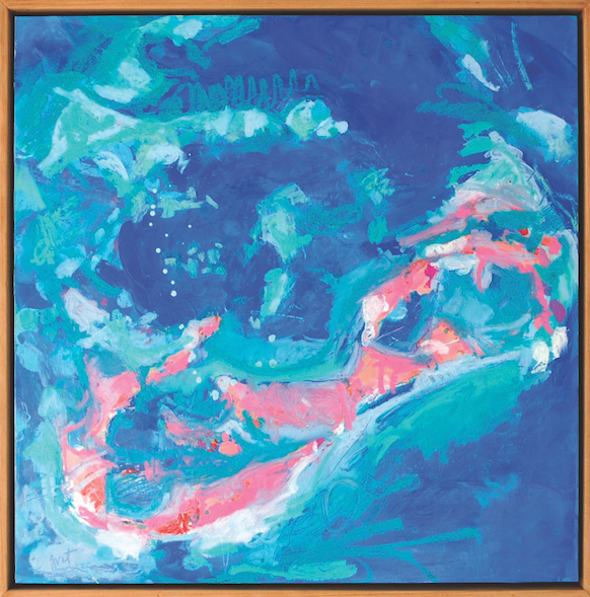 “I try to approach each new work with fresh eyes, allowing myself moments of spontaneity in the painting process and appreciating it when the paint surprises me,” he says. View more of William R. Beebe’s work at williamrbeebe.com. The artist Catherine Erb believes that, as a culture, we’re obsessed with viewing the world through our own personalized lenses. So rarely do we look at things from a different perspective, a different vantage point. 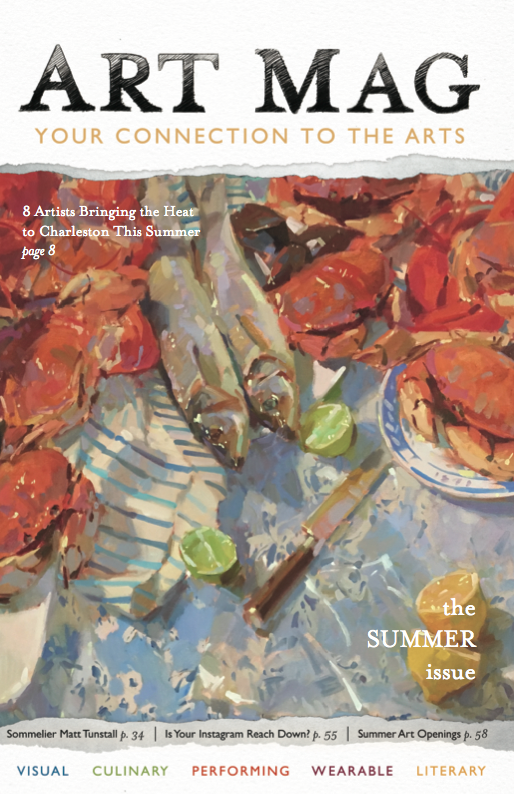 View more of Catherine Erb’s work at The George Gallery. 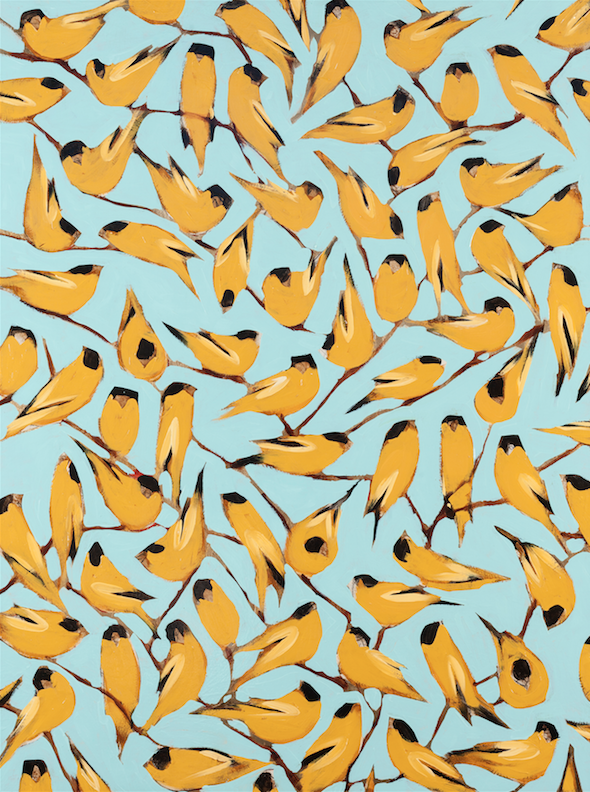 An artist fascinated by imagery, Bradley paints birds—typically goldfinches—in a rhythmic pattern. Look at the work long enough, and you lose a sense of the subject, though you can quickly come back to it by fixating on just one member of the flock. According to the artist, the work is a process of layering, intuition, and experimentation. 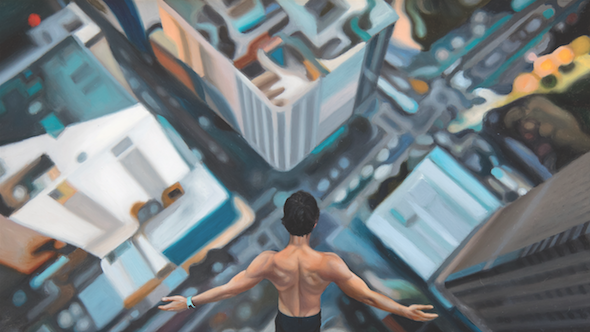 View more of Joseph Bradley’s work at Atrium Art Gallery. 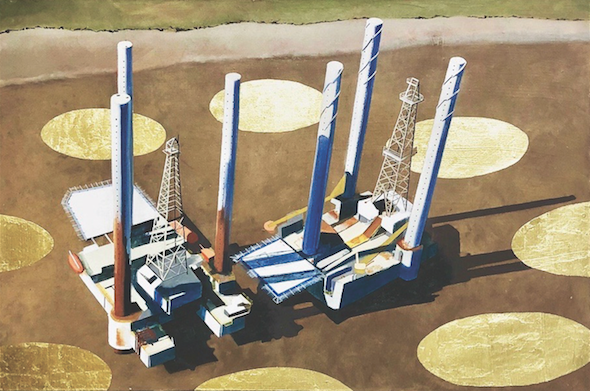 “I love looking at Google Earth,” admits Gret Mackintosh, a somewhat new-on-the-scene artist who paints out of a studio in Charleston’s Redux Contemporary Art Center. 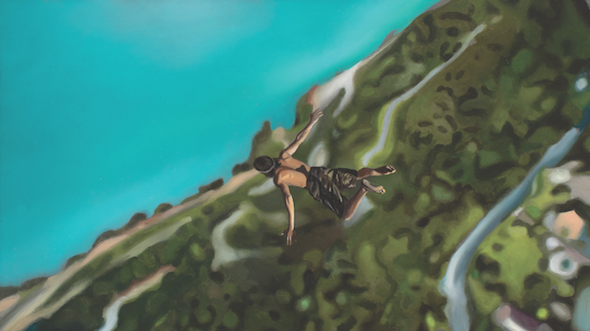 This fascination with online aerial views joined forces with a background in landscape architecture and love of water to push her to explore aerial landscapes as her next series of paintings—“my first series as a full-time professional artist,” she adds. The series will focus on Lowcountry waterways. “The patterns made by the water combined with our manmade environment are endlessly fascinating,” says Mackintosh. “I start by gridding off the canvas and sketching the map out in a rather formal way”—that’s her inner landscape architect at work. “Then the real fun starts. I choose a color palette to work with and explore different materials, textures, shapes, and layers.” She calls the final result a map-meets-abstract-art mish-mash. View more of Gret Mackintosh’s work at gretmackintosh.com. Marissa Vogl’s last name is also the German word for bird (though that’s spelled “vogel”). 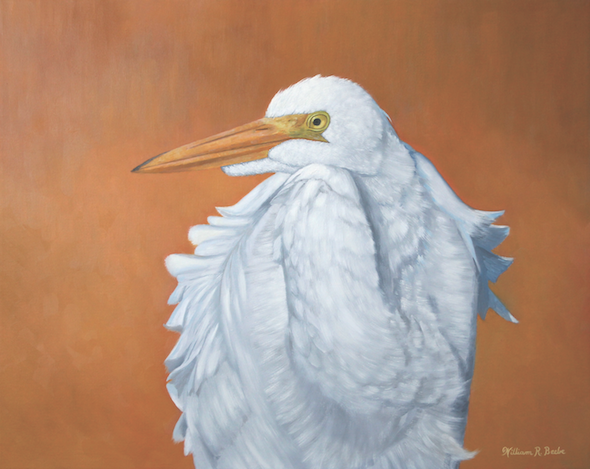 That alone is enough to spark a connection with the feathered animal, but for Vogl, who grew up in Montana, there’s more. “For as long as I can remember, my mother would stand at the window searching for the first sight of spring—a bluebird,” she says. “We’d celebrate at the first spotting and call all our family members to let them know spring had arrived.” The Vogls revered the bluebird so much that her grandfather built bluebird houses for all of his children, and they lined them up along their 20 acres of barbed wire fence at the base of the Elkhorn Mountain range. “After my grandfather passed, we all believed he visited in the form of a bluebird,” she says. 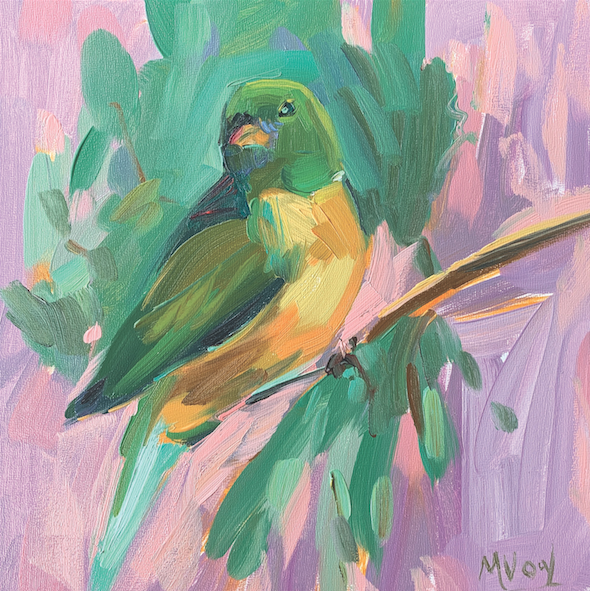 Today, Vogl paints birds in bright colors and with loose brushstrokes—typically on an 8” x 8” birch panel. 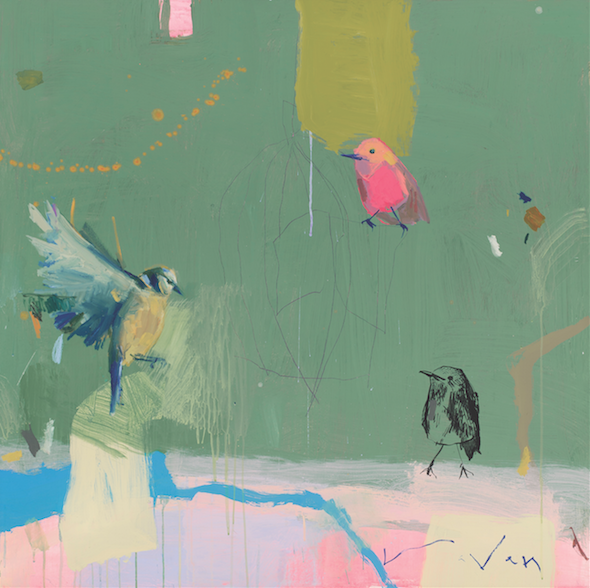 Each bird exudes personality, reinforced by names such as “Dolly,” “Eeyore,” and “The Bouncer.” The paintings have become quite coveted; in fact, hundreds of collectors, called “Vogl’s Bird Watchers,” receive a monthly email for first dibs on the newest paintings, which quickly fly out the window. View more of Marissa Vogl’s work at Meyer Vogl Gallery. When a bird flies over the Charleston peninsula, he’s in for a treat—a rainbow of historic homes, church steeples, and rooftops. 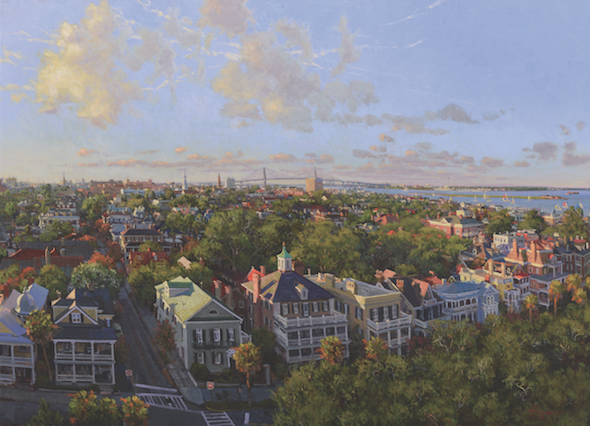 For many years, artist West Fraser has been painting this Charleston “rooftop” view seen only by birds and people with access to high places. What keeps bringing him back to the subject? View more of West Fraser’s work at Helena Fox Fine Art. Karen Hollingsworth paints birds and other animals, from regal-looking zebras to tiny inchworms, with a bend towards realism. 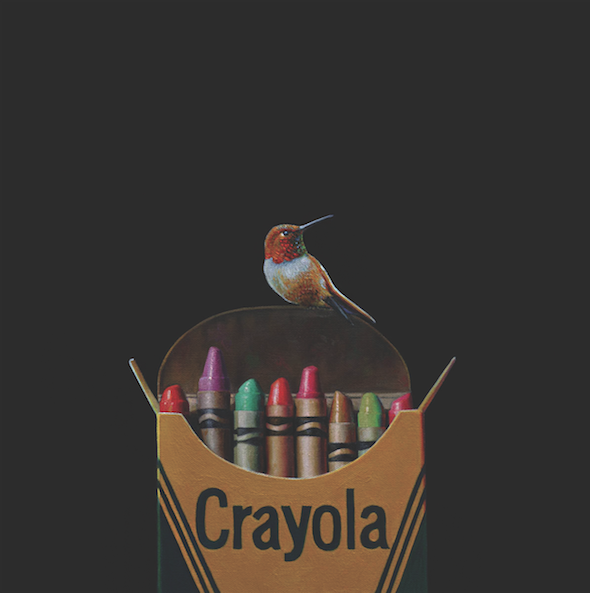 What makes the work dreamlike and somewhat whimsical is the animals’ whereabouts—the birds are not in a tree or nest or sky, but perched on top of an elephant that happens to be in a boat, or a box of crayons, or crinkled Starbucks bag, usually set against a stark black background. But capture their personalities she does. Some of Hollingsworth’s birds exude curiosity; others are proud; others are mischievous. No matter what the bird is thinking, or where he’s perched, she draws the viewer in to look and linger a little longer. View more of Karen Hollingsworth’s work at Principle Gallery. 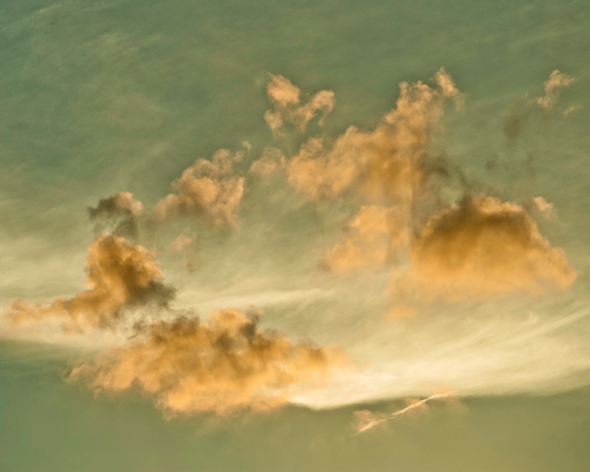 When Charleston artist Kate Hooray Osmond isn’t in her art studio, you may be able to find her 1,000 feet up in the air, in a helicopter, looking down. 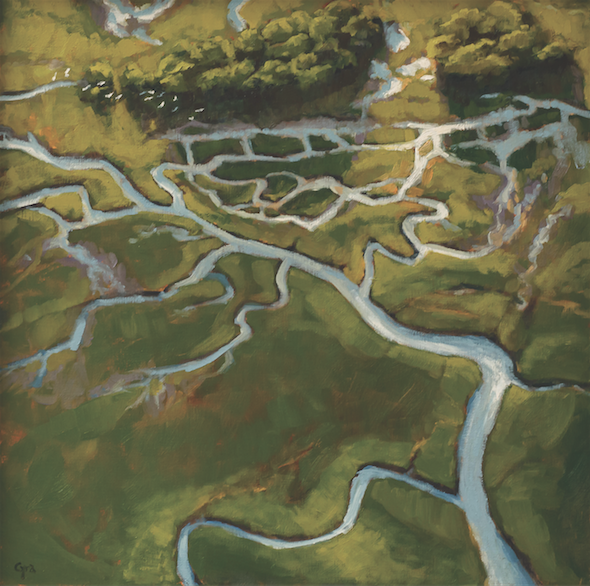 The artist is fascinated with viewing the earth from this entirely different perspective—from a bird’s eye view. 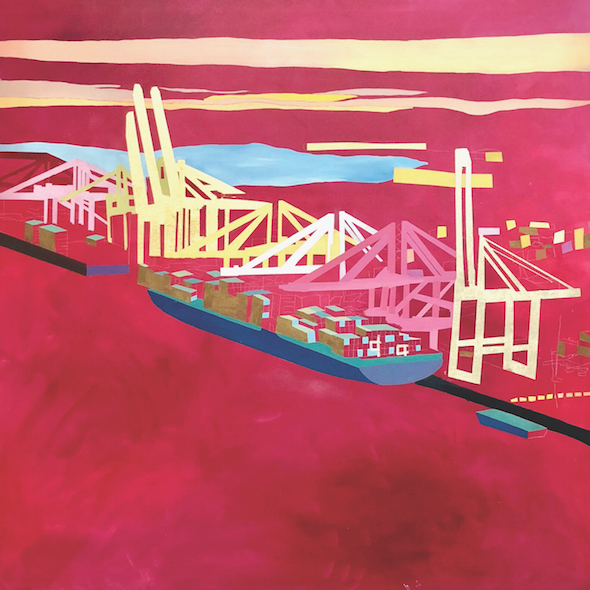 She recreates those views with paint and gold leaf, often depicting coastlines and aerial peeks at different industries, such as ports and factories. The industrial work turns a potentially drab picture into something beautiful, showing off its patterns and sequencing and color. And while it’s beautiful, the artist says her work is intended to prompt viewers to consider social issues. 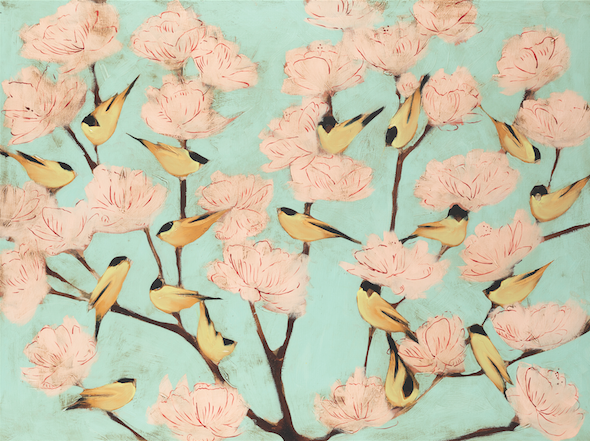 View more of Kate Hooray Osmond’s work at Miller Gallery. Humans may never know what it feels like to spread their wings and fly, but—thanks to drone technology—we can create pretty incredible photographs of what birds must see from way up there. 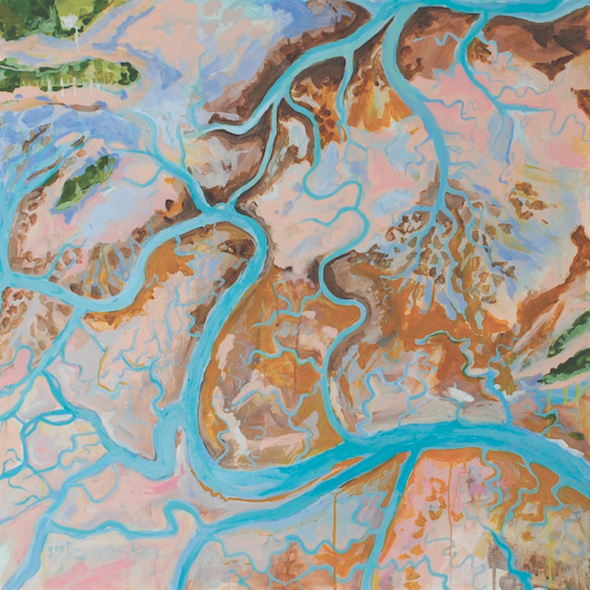 Using images from his own drone camera, photographer and painter Michael Cyra recently found inspiration for a series of aerial-view oil paintings. The artist says that painting the scene allows him to share a mood and atmosphere beyond what he is able to capture on film. 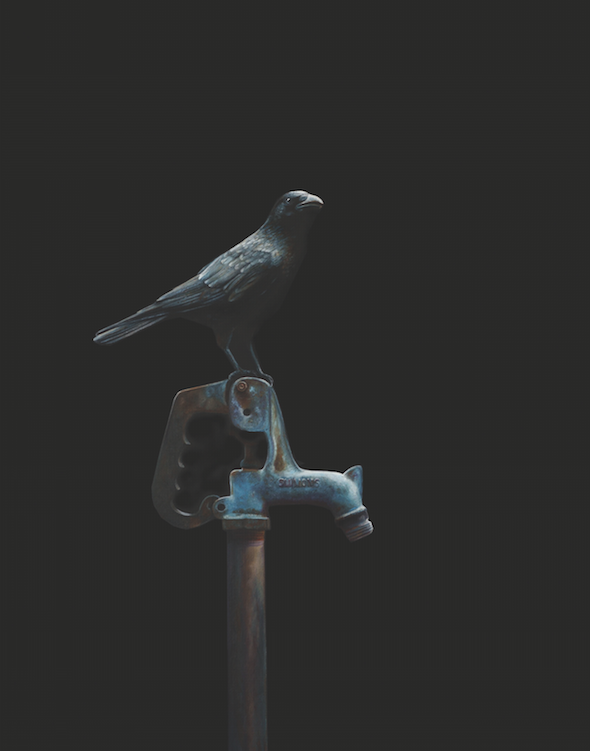 View more of Michael Cyra’s work at Hagan Fine Art. 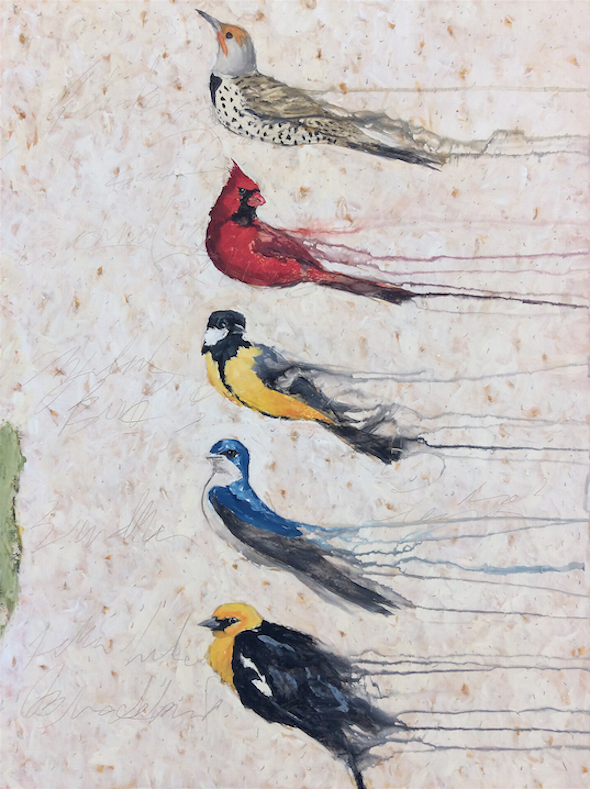 “My parents named me after a bird, and I’ve felt a connection to them since I was young.” So says Raven Roxanne, the Charleston artist whose bird paintings and abstract “Nest” series have helped ignite the art bug in many budding collectors—many of whom make up the artist’s more than 30,000 Instagram followers—and attracted the attention of big-name retailers alike. 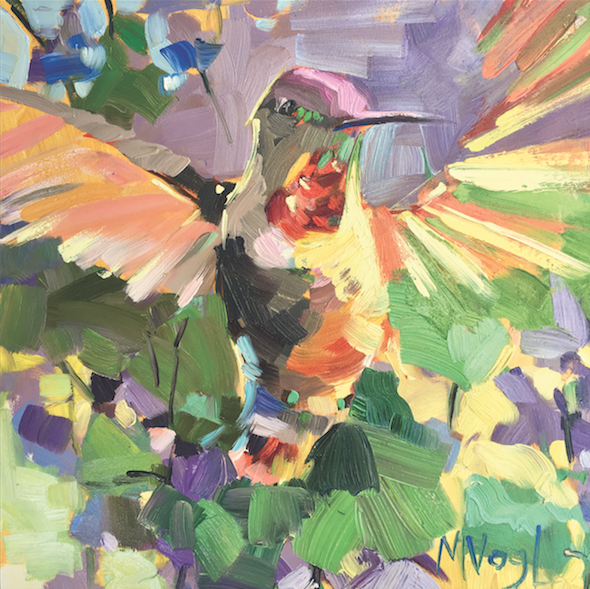 In the spring, a national retailer will be releasing a tabletop collection featuring Roxanne’s birds, and she plans to set loose a new collection from her bird series toward the end of the summer. View more of Raven Roxanne’s work at ravenroxanne.com. View more of Robert Lange’s work at Robert Lange Studios. 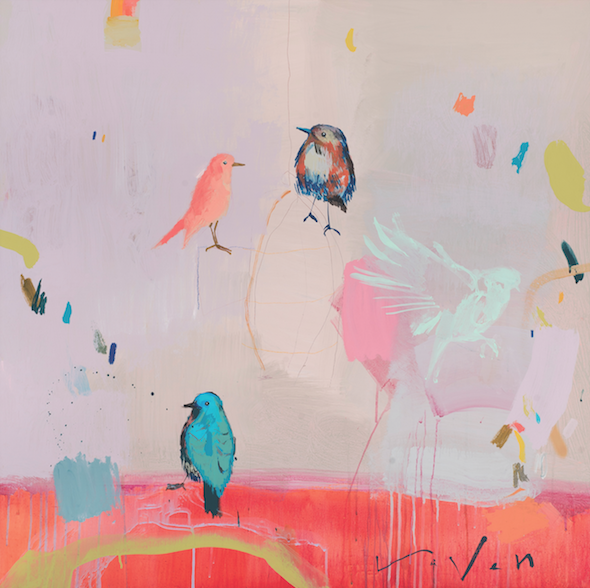 So Dickter creates birds—with the use of panel, pencil, and oil paint. 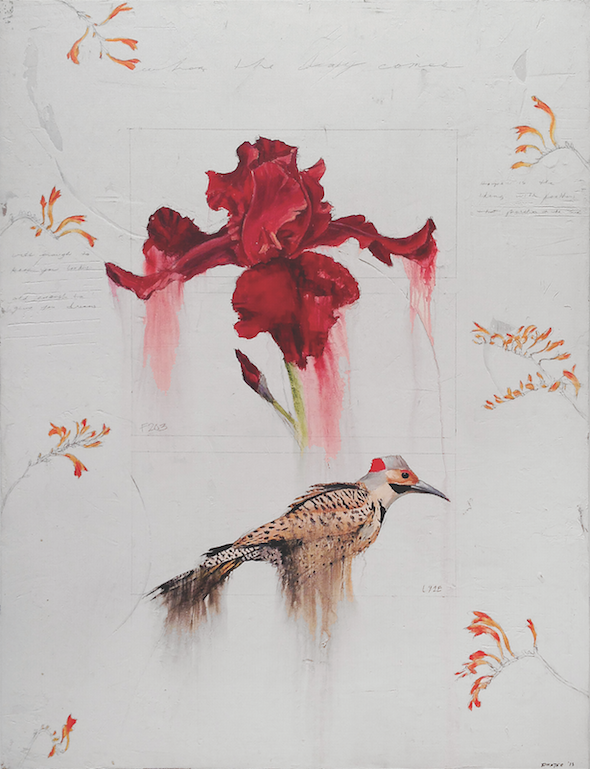 Dickter’s birds are not captured in their natural environment; that’s not what interests the artist. Instead, they are depicted in vibrant colors against a mostly white background, save for some pencil markings, paint drippings, and the occasional flower. The birds appear to be caught in a moment, allowing the viewer to study the bird itself—its fire-orange heads contrasted against a black-and-white-specked body and grey wings. Beautiful, yes, but fleeting. The artist says he’s interested in creating permanent records through his art, as the world we live in is transient. View more of Michael Dickter’s work at Mitchell Hill.